It was by chance that he began playing amateur football - standing in at Millspaugh FC when their goalkeeper failed to turn up. He then joined Romarsh Welfare, a much better team, but was 'sacked' after letting in 15 goals in his first 2 games! Banks joined Chesterfield in 1955 but only played 23 games for their league side before moving to Leicester City. Whilst at Leicester, Banks was spotted by Alf Ramsey (who was in charge of the England team) and 'groomed' for the World Cup team. By 1966, Gordon Banks was fully established as England's No.1 goalkeeper - spectacular saves, perfect positional sense and a pair of hands as "safe as the Banks of England" (as they were often described!) were his hallmarks. Banks kept 'clean sheets' in the early rounds of the 1966 World Cup, until the semi final, when he let in a penalty. Although conceding 3 goals in the Final, Banks was easily considered to be the best goalkeeper in the tournament. Banks became world famous for his 'Save of the Century' in Mexico. England were playing Brazil in the first round of the 1970 World Cup. During the game, a Jairzinho cross was met perfectly by Pele who headed it down to Banks' right. He managed to flick the ball over the bar for a corner. Pele later described the save as the "greatest he had ever seen". I met England's greatest goalkeeper at the Birmingham NEC in August 2005. He was the first of the England players to sign my England shirt which you can see us holding in the photo. 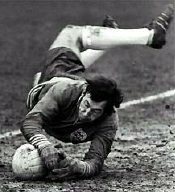 Do watch Don Mullan's short video (click link on left) of Gordon Banks - it shows the goalkeeper's skills far better than still photos! YouTube - "Save of the Century"
His autobiography, Banksy, My Autobiography, was published in 2002 and in 2006, Banks was honoured with a bronze plaque placed in the pavement outside Sheffield's Town Hall, the first person to be installed in the city's 'Walk of Fame'. During his England career, Banks played 73 matches, conceding 57 goals but keeping no less than 35 'clean sheets'. Banks remained in football for a while - as a scout and then as manager of non-league Telford. He also played 29 games with the American side, Fort Lauderdale Strikers, in 1978. Banks was transferred to Stoke City in 1967, for a fee of £52,000. Although he was by then acknowledged as the world's best goalkeeper, he had become an understudy to a future England goalkeeper, Peter Shilton. Banks had played 293 league games for Leicester and went on to play 194 games for Stoke. This would have been more had Banks not been in a car accident in which he lost the sight in his right eye. Just a few weeks earlier Banks had been voted 'English Player of the Year', and had also won the League Cup with Stoke. In 1970, Banks was awarded the OBE for his services to football. 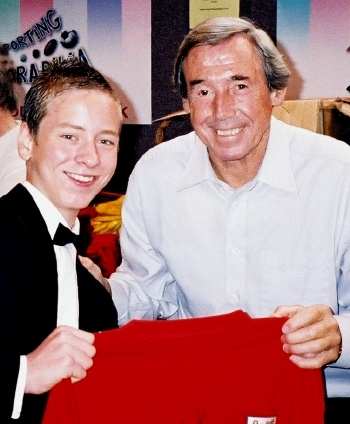 Gordon Banks was born in Sheffield in 1937, and although he played football for Sheffield Boys whilst at school, he had little idea that he would be doing so as a career. After he left school, he became a coalman's assistant - bagging & delivering coal - and later was apprenticed to a bricklayer. Safe as the "Banks of England"